Happy New Year from The Iron Horse Chronicles. 2014 saw the publication on October 22nd of Eagle Talons, the first book in my trilogy about Will Braddock’s quest to determine his own destiny at the time of the building of the first transcontinental railroad in 1867. I am thankful for all the encouraging comments that I have received from readers of Eagle Talons. 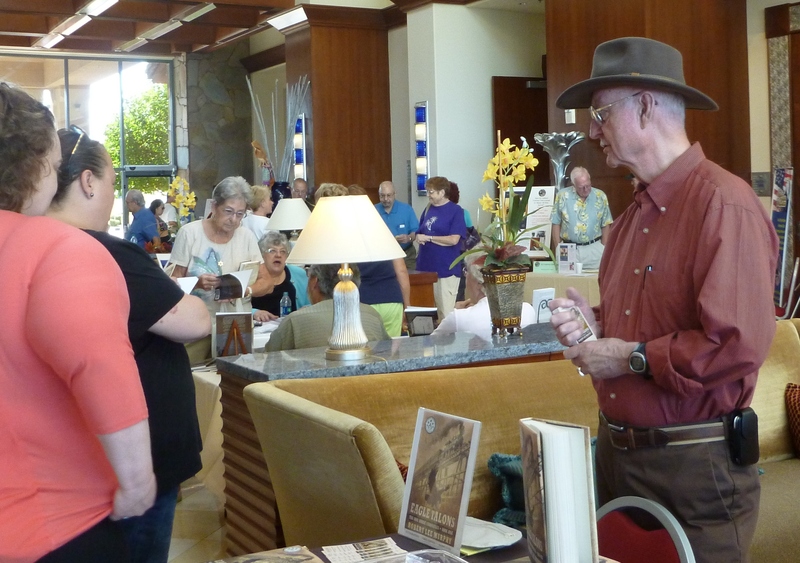 The book signings in 2014 were fun and productive. 2015 begins with me working with Five Star Publishing on the final editing of Bear Claws, the second book in the trilogy. It is scheduled for publication in October 2015. In Bear Claws, Will Braddock continues his work with the Union Pacific Railroad, becoming involved in the UP’s expansion of its iron rails across Wyoming. Will makes a trip to California, where he learns about the difficulties facing the Central Pacific Railroad as it struggles to drive its tracks across the rugged Sierra Nevada Mountains. Once again, Will must put his own life on the line to protect someone–this time, none other than Ulysses S. Grant, the Republican presidential candidate. Of course, in 2015 I will continue writing Golden Spike, the concluding book in the trilogy, wherein Will and his friends become embroiled in the fascinating and frustrating events in 1869 leading up to the joining of the UP with the CP at Promontory Summit, Utah. An exciting venture that commences with the new year is the launching of Middle Grade Historical Fiction, a blog created for history teachers and librarians. I have been invited to join several others who write historical fiction for young readers as a blogger contributing to this special website. My first posting is scheduled for January 22nd. As soon as the website is officially launched, I will provide you with a direct link. On a final, more personal, note at the beginning of the new year, I hope and pray that my wife, Barbara, enjoys full recovery from her recent back and nerve surgeries. This entry was posted in Bear Claws - Book Two, Central Pacific, Eagle Talons - Book One, Golden Spike - Book Three, Iron Horse Chronicles' Characters, The Iron Horse Chronicles, Transcontinental Railroad, Union Pacific and tagged Adventure Fiction, Bear Claws, Eagle Talons, Fictional Character, First Transcontinental Railroad, Five Star Publishing, Frontier Fiction, Golden Spike, Historical Fiction, Pioneer Life, Teen Fiction, The Iron Horse Chronicles, Western Fiction, Westward Expansion (1867-1869), Will Braddock, Young Adult Fiction, Young Readers. Bookmark the permalink. I always enjoy your blog posts, and I “always” learn something! Much luck to you in the New Year with the Iron Horse Chronicles. Readers have a lot to look forward to … and maybe I’ll get an invite to guest blog on your Middle Grade Historical Fiction site 🙂 hint hint Really, your blogs are great and so are your books! Congratulations to you on such a good year,it is well deserved. I will be anxious to see your blog. I hope your wife recovers completely and you and yours will have a Happy and Healthy New Year.